Claire is from North Wales and is currently in her final year at vet school at the RVC and also has a degree in Animal Behaviour. 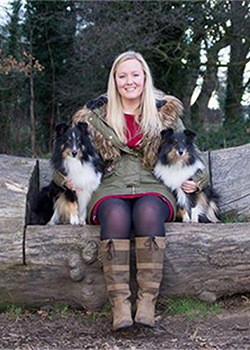 She has been involved with therapy work for the last 14 years and has two Shetland Sheepdogs, ‘Brackie’ and ‘Jester’. They have competed in obedience, heelwork to music and agility as well as bringing so much joy to many people’s lives with their therapy work. Claire is so excited to be involved with the ‘TDN’ Cadets.